We only just learned that a proper Ghostbusters 3 is finally happening and Sony has already released the first teaser trailer for the upcoming sequel. Jason Reitman, the director behind movies such as Juno, Up in the Air and The Front Runner, who also happens to be the son of Ivan Reitman, director of the original 1984 classic, has been tapped to helm the new movie, which will take place in the same universe as the original. To hype things up, the director has already shot a teaser that is sure to get fans feeling all sorts of nostalgic. The teaser is very atmospheric. We see a a dark, cloudy sky in the dead of night, while the camera pans through a field with a rundown old barn in it. We then start to see light spark from the barn, with some rather jarring sounds as the camera continues to work its way up to the barn to reveal what's inside. If one looks closely, there is some ectoplasm on a nearby fence. Something supernatural is stirring about. The trailer also makes use of the score from the original movie from the library scene. Once at the barn, a large tarp is then blown up by what seems to be a Proton Pack being fired up to reveal the back of the original Ecto-1 before the footage cuts out. "Summer 2020" then flashes across the screen, with the letters surround in Slimer-esque green. It's a teaser in the true sense of the word. It raises far more questions than it answers. Whose property is that? What supernatural business is about to befall the Earth? 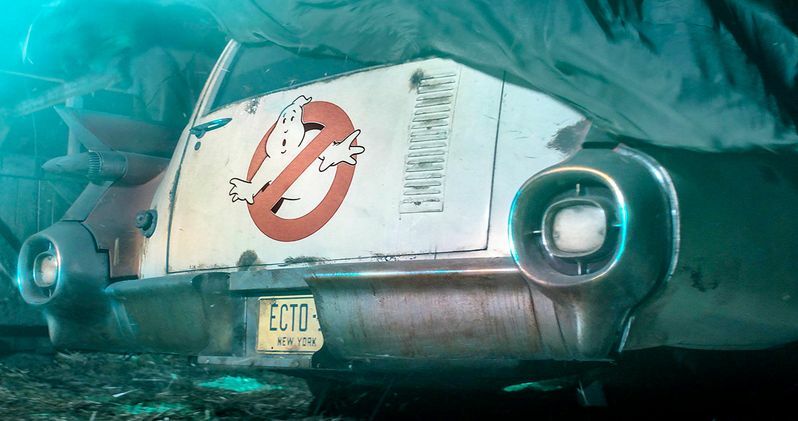 Why is the Ecto-1 covered up and looking so worn down? Who is in the barn? But What this does do is assure fans everywhere that this is a movie that is actually happening and soon. Ghostbusters 3 is as real as it's ever been. Sony tried something new with the franchise with director Paul Feig's 2016 all-female reboot of Ghostbusters. Unfortunately, the movie didn't connect with audiences in the way that the studio had hoped and was a pretty hefty bomb at the box office, bringing in just $229 million worldwide working from a very steep $144 million production budget. Ever since, the fate of the franchise has been unknown. As it turns out, Sony has been quietly putting together the sequel it would seem many fans wanted in the first place. Little is known about the new movie currently. It isn't clear if Dan Aykroyd, Bill Murray or Ernie Hudson will reprise their roles just yet, nor has it been announced what new cast members will be busting ghosts next summer. What we do know is that things are coming together quickly, with Jason Reitman co-writing the script in addition to directing. Production is expected to begin in the next few months, so we should be learning a lot more in the relatively near future. Be sure to check out the first Ghostbusters 3 teaser trailer below. This news was first reported by Entertianment Weekly.